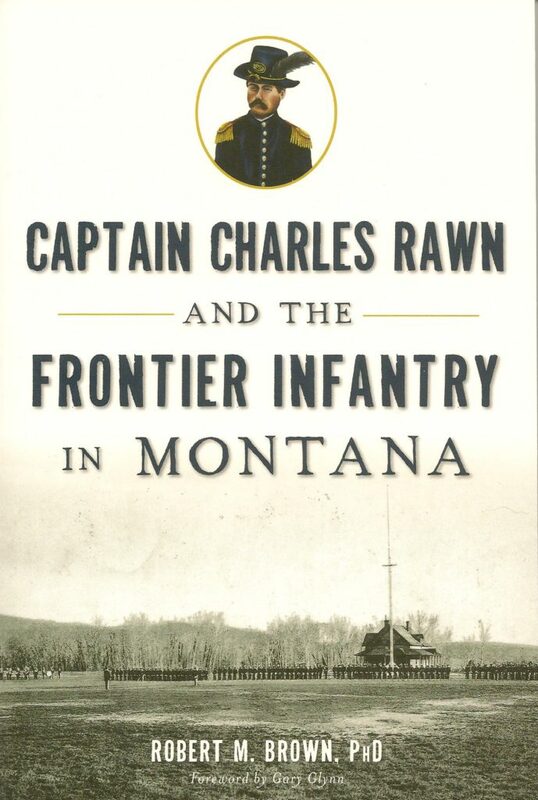 My friend Robert M. Brown has published a new book on Captain Charles Rawn and the Frontier Infantry in Montana, published by History Press in 2016. Bob asked me to write a foreword for the book, which I was happy to do and which can be found below. Check it out. It’s a good book! A full account of the Bicycle Corps can be found in That Beautiful Little Post: the Story of Fort Missoula. Moss sent his uniformed cyclists pedaling through the valleys of western Montana in the summer of 1896, delivering messages to remote outposts. By the end of the summer, Moss and his men embarked on an eight hundred mile tour of Yellowstone National Park which proved so successful that Lieutenant Moss decided to push his bicycle corps to the limit, and during the winter of 1896 he planned a new trip. His goal was St. Louis Missouri, half a continent away. 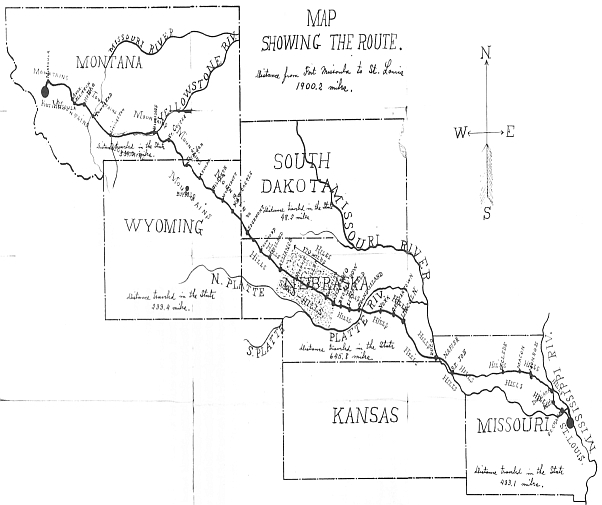 Since many of the roads in the West were little more than unimproved horse trails, Moss planned to follow the route of the new Northern Pacific railroad to Billings, then along the route of the Burlington railroad to St. Louis. Knowing he had no sag wagon to rely on, Moss chose his route carefully, shipping supplies and spare bicycle parts to fourteen railroad stations along the route. “Bad roads, Hard Winds, Alkali Water, Rattlesnakes and many other pleasures” was how a local newspaper described the United States Army’s first extensive test of the bicycle. Armed with the grandiose title of the Fort Missoula Bicycle Corps, twenty‑three soldiers pedaled their heavy, balloon‑tired bicycles past the front gate of a frontier military outpost in Montana on a cloudy gray day in 1897. The cyclists (they preferred to be called wheelmen) were headed to St. Louis Missouri, nineteen hundred unpaved miles from their starting point. 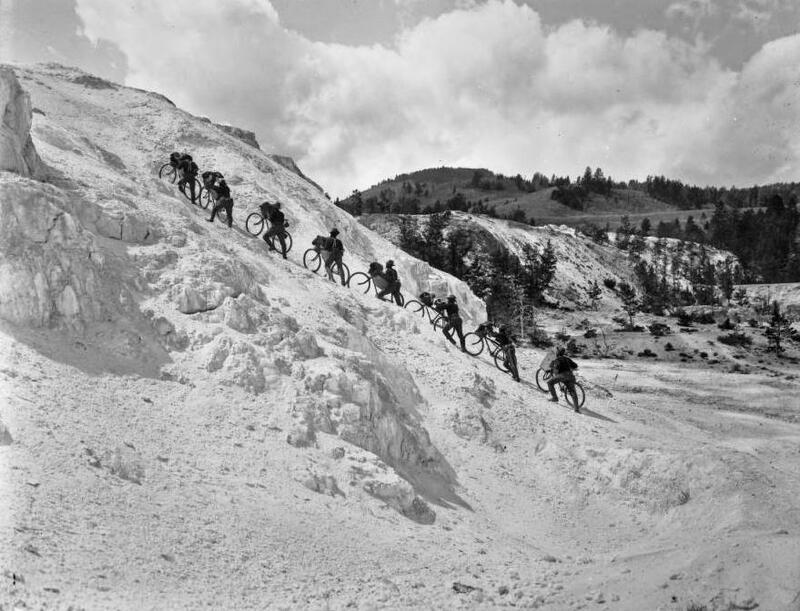 Members of the 25th Infantry, they carried rifles, ammunition, and camping gear as they pushed their bikes through a blizzard on the Continental Divide, dealt with hailstorms, rattlesnakes, intense heat, and roads that were never intended for bicycling. Mud clogged their tires, rain soaked them day and night, and illness, “skeeters”, and exhaustion took their toll; nevertheless, their forty day journey to St. Louis was an unqualified success. On July 24, forty days after leaving Fort Missoula, the Bicycle Corps were escorted into St. Louis by local bicycle clubs. Thousands of curious onlookers lined the streets as they pedaled the last few miles to their campsite at Forest Park. The weary troopers regaled local cyclists with their adventures, while Moss, Kennedy and Boos were entertained by the leading citizens of St. Louis. 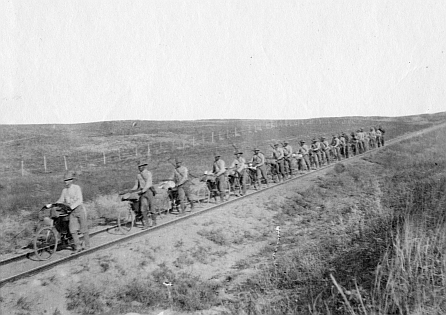 A few days later, the soldiers cheered the news that they would be returning to Montana by train. Despite the rain which had plagued them two out of every three days, Lt. Moss and his men had conclusively demonstrated that bicycling was an effective means of military transportation. 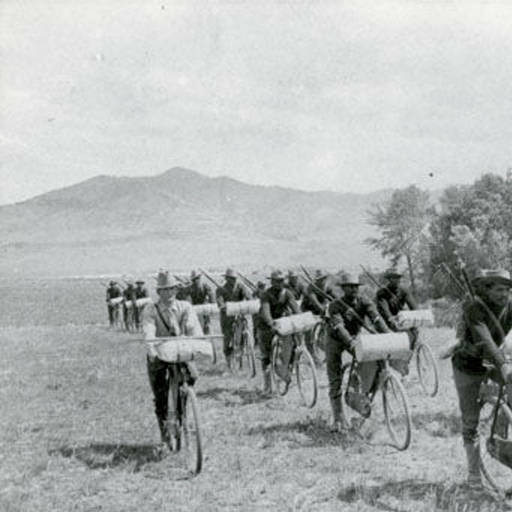 Although one man had been unable to keep up and had returned to Missoula halfway through the trip, the soldiers and their bicycles had stood the trip remarkably well. Resting only two days out of forty, they had averaged forty‑seven miles a day on their nineteen hundred mile journey. • January 1 – Two new state supreme court justices were sworn into office. • January 3 – U.S. Navy carrier aircraft bombed Formosa and the Ryukyu Islands. • January 4 – Congress authorized $42 million for the construction of Hungry Horse dam. • January 5 – Two Nisei working at Essex for the Great Northern Railroad were arrested in Kalispell for impersonating FBI agents. • January 6 – A prisoner escaped from the Fort Missoula Detention camp. • January 8 – Margaret Park in Great Falls was renamed Charles M. Russell Park. • January 9 – The U.S. Army began landing at Lingayen Gulf on Luzon. A Gore Field pilot died in a crash in the Yukon. • January 10 – Another Fort Missoula prisoner escaped. • January 12 – A major Soviet offensive began on the Eastern front. Civilian ammunition sales halted once again. • January 14 – Rep. James O’Connor died in Washington D.C. of a sudden heart attack at age 66. • January 16 – Vandals broke 100 windows at Lowell School in Great Falls. 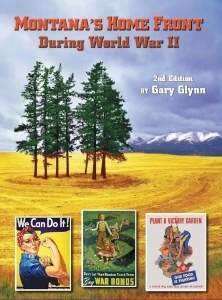 • January 18 – The Meatless Tuesday program was reinstated, as was butter rationing. • January 20 – Rep. James O’Connor was buried in Livingston. • January 21 – Hungary declared war on Germany. • January 22 – Chinese forces cleared the Ledo road, opening a land route to China. • January 25 – U.S. troops retook Clark Field in the Philippines. FBI agents arrested three Butte men suspected of operating a major auto-theft ring, and seized contraband tires, tubes and tools. • January 30 – Fire destroyed the Eager Company store in Winnett, the largest business in Petroleum County.